iCal is an easy, default choice to track your meetings, events, and appointments. It’s installed on every Mac, and—provided you have a MobileMe account—it synchronizes your calendars simply and seamlessly between your computer and your iOS devices. But iCal isn’t much help when it comes to calculating the amount of time you spend on each task—the program doesn’t even have a list view. TimeTable mines your iCal data to tabulate the time spent on particular tasks, making it a good tool for consultants and other people who need to track their time. For billing and invoicing purposes, you can assign a single pay rate to all calendars or a different rate for each calendar; each calendar’s rate appears in TimeTable’s sidebar. The program automatically calculates the cost of each event (rate times duration) and displays the total in the Cost column. After filtering and selecting the calendar data you want, TimeTable lets you export it as a plain-text file, an e-mail message, or a comma-separated-values (CSV) file, ready for import into a spreadsheet or invoicing program. TimeTable has gained several improvements since Macworld last reviewed it, back in 2009. You can now view events in multiple calendars simultaneously, instead of just one. Event durations can now be viewed as decimal numbers, as total minutes, or in hours:minutes format. And the program now shows you a preview before it exports your data to a text file or e-mail message. Before exporting information, TimeTable shows you a preview of selected events in your chosen calendars and calculates the total time and charges for those events. However, the program has also increased in price by $5 since that review, and at $20, it’s getting closer in price to $40 programs such as Marketcircle’s Billings or IGG Software’s iBiz that are considerably more feature-rich, including extensive options for customizing invoices and payments. These programs also allow you to capture billable items that you might not put into iCal, such as timed telephone support or reimbursable expenses. 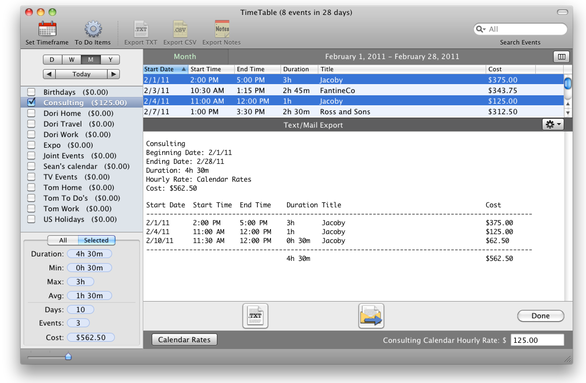 iBiz even synchronizes events with iCal, albeit in a considerably more complex fashion than TimeTable. Still, TimeTable does a good job of extracting data from iCal, and if your main goal is to track the amount of time you spend on different activities, it will probably be all you need—it’s dead-easy to use and worth the $20. Tom Negrino is a book author and longtime contributor to Macworld. His latest book is Keynote for iPad: Visual QuickStart Guide (Peachpit Press).